The Consolidated Bank of Canada, as the name suggests, was the combination of two banks, The City Bank of Montreal and The Royal Canadian Bank. Both institutions were struggling at the time of the merger. The Consolidated Bank only lasted from 1876 until 1879. During that time it only issued one type of bank note. All paper money from The Consolidated Bank of Canada was printed with a date of 1s July, 1876. The British American Bank Note Co. Montreal printed all of the money. Four, five, ten, twenty, fifty, and one hundred dollar bank notes were issued. The ten dollar note is by far the most common. Examples are regularly available for around $100. Some five dollar bills are also relatively common. The $20, $50, and $100s bank notes are extremely scarce. Four dollar notes can be rare as well. Some four and five dollar bills have blue overprints. The overprints can be B, NH, Belleville, St. Catherines, C, Seaforth, D, Sherbrooke, Galt, Toronto, Hamilton, Woodstock, and N. The actualy overprint doesn’t really affect the value. Just the fact of whether or not an overprint is present is what matters. Contact us for more information. We buy all types of Canadian currency. 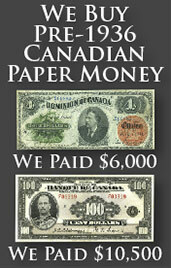 We are especially interested in bank notes from The Consolidated Bank of Canada in Montreal. You might be surprised at how much money we can offer for some currency. Send us an email with pictures of the front and back of your bank note and we will respond quickly with our offer. 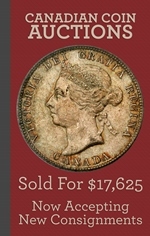 Your piece of currency from The Consolidated Bank of Canada in Montreal could look similar to the one seen below. Our guide above has lots more information about each different denomination. Contact us for more value information.